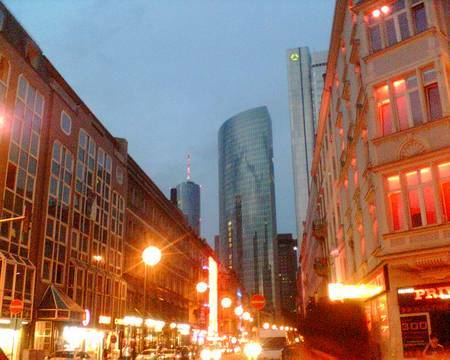 A week in Frankfurt am Main, and it already feels like I’ve never really left this place 8 years ago. Images, scenarios, smells, speeds, people, this peculiar atmosphere – a very familiar place with lots of interesting sights and sounds. One of those really nice places in Frankfurt is the restaurant “Im Herzen Afrikas” (“In the heart of Africa”), which is something like a mixture of the 40 Thieves place at Diani Beach (because of the sand and numerous comfy corners) and one of those typical Ethiopian/Eritrean restaurants = good food and nice coffee. These folks over at the restaurant organized some sort of beach party – in the middle of downtown Frankfurt, just about 100m away from the European Central Bank, in a close section of the road that passes in front of the restaurant. A beach party with real sand (! ), a kids corner, life music, a DJ and a beautiful atmosphere. It started at around 1 pm and we went there at around 8pm and stayed for a few drinks. Ok so I missed taking some decent pictures of the event as I was busy munching some fine Injera and getting jiggy with someone special, but for those lovers of comfy places with that special atmosphere in the middle of Europe: you certainly missed this! ==> Does anyone know of Kenyan joints in the Rhine-Main Area? Glad to see you are having fun in Franfurt Jke: “getting jiggy with someone special” -Haiya me has been thinking I was the only special one. mmmhhhh men!